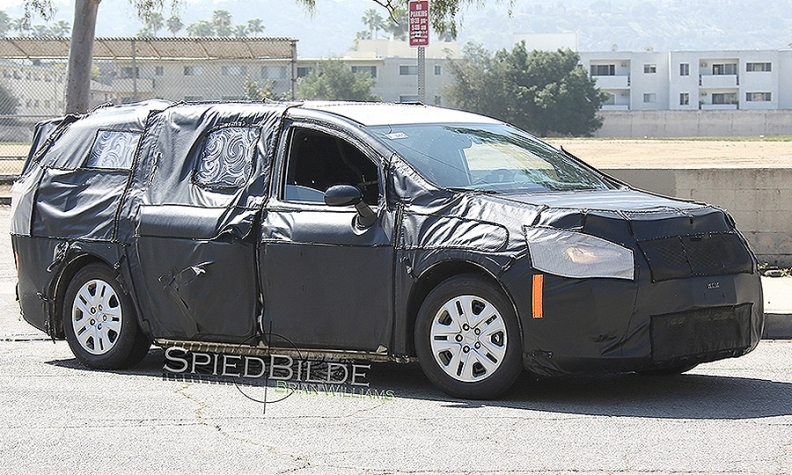 Is this test mule a prototype of a future Fiat Chrysler minivan with a hybrid powertrain? Spy photographers have captured images of a next-generation Dodge minivan mule -- likely testing a hybrid powertrain -- driving in the U.S. Southwest. The problem: There isn’t supposed to be a next-generation Dodge minivan in the United States. The mule had Dodge’s latest steering wheel, taillights similar to those of the Dodge Durango and Dodge colors on the electronic instrument cluster. Notably absent from the center of the obscured crosshatch grille was the Chrysler brand’s floating winged badge. The mule doesn’t appear to have an obvious tailpipe and its undercarriage has a long, seamed spot weld between its wheels, perhaps as a modification to house what will be a large battery pack below the floor. As late as January, Fiat Chrysler CEO Sergio Marchionne reiterated that the automaker’s next minivan would be branded a Chrysler. But he noted that Reid Bigland, head of U.S. sales and head of what is now FCA Canada, had championed keeping the better-selling Dodge Grand Caravan name alive, at least in Canada. FCA is transitioning Dodge into a performance-oriented brand and Chrysler from near-luxury to more of a mass market brand, similar to Toyota, Ford and Chevrolet. The next-generation minivan is due to be unveiled at the 2016 Detroit auto show. A plug-in hybrid version -- expected to get the equivalent of 75 mpg -- is to follow shortly after the launch. A Fiat Chrysler spokesman today reconfirmed earlier statements that the company's next-generation minivan will be a Chrysler branded vehicle -- not a Dodge. FCA’s Windsor Assembly plant in Ontario is shut down for retooling in advance of the next-generation minivan, which is scheduled to go into production in early 2016. The plant shut down Feb. 13 and is expected to resume output in late May.